A tribute to the divine lady of song, Miss Nancy Wilson features Nancy Wilson’s Emmy-nominated musical director and pianist, Donn Trenner, and the heart-warming vocals of jazz vocalist and Miss Wilson devotee, Sylvia Mims. 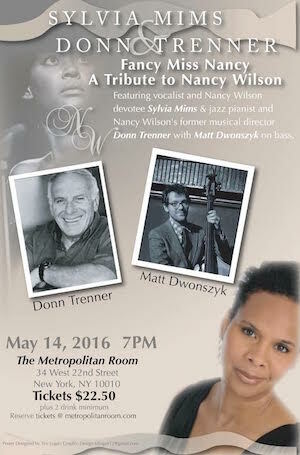 Donn Trenner, a legendary musical director, who has worked with a who’s who in the entertainment business including Steve Allen, Shirley McClain, Chet Baker, Charlie Parker, Lena Horne, Bob Hope, and Anne Margret, worked with Nancy Wilson as her musical director for a number of years. In his 2015 memoirs, titled “Leave It To Me: My Life In Music”, Mr. Trenner devotes an entire chapter to his touring with Nancy Wilson, and will relay some of these stories during the “Fancy Miss Nancy” show. Sylvia Mims grew up listening to her parents’ Nancy Wilson records. An admirer of Miss Nancy’s unique vocal stylings and elegance, Ms. Mims is a direct musical descendant of her mentor in phrasing, range, and color. A 2012 winner of the American Fine Arts vocal competition, Ms. Mims has played at notable performance venues in New York and Los Angeles, and recorded her debut CD titled Where Lovers Live with Donn Trenner on piano in 2014. Joining Donn Trenner and Sylvia Mims will be the very talented bassist Matt Dwonszyk. You don’t want to miss the opportunity to see this magical trio perform some of Nancy Wilson’s classic songs and hear stories about Fancy Miss Nancy.